In Front of a Red Evening Sun, no date, Oil on canvas, 31 1/4 x 29 3/8 in. Hannah Höch was one of the few women artists to participate in the anti-art Dada movement of the early twentieth century. As a printmaker, painter, collagist, and photomontagist, Höch was part of the intellectual renaissance of Weimar Berlin as well as the Berlin Dadaist circle. Her artwork documented the political and social turmoil caused by World War I, as well as the newfound gender issues associated with women earning the right to vote, becoming more financially independent, and acquiring sexual liberation. Anna Therese Johanne Höch was born in Gotha, Germany, in 1889. She studied graphic arts at the College of Arts and Crafts in Berlin from 1912 to 1914 until she was recruited to work for the Red Cross during the war. Höch also trained in fabric design and textiles after her time spent in the war, working part time for Ullstein Verlag, Weimar Berlin’s largest publishing empire. She created lace tablecloths and needlepoint patterning and most notably had access to the company’s catalogues which she used to create her early photomontages. In 1915, Höch met Raoul Hausmann and through him became associated with the Berlin Dadaists. Hausmann and Höch, under the influence of Dadaism, perfected the art of photomontage and used it as satirical propaganda. Höch became the only female to show works at the First International Dada Fair in 1920. In 1922, Höch ended her relationship with Hausmann and left the Berlin Dadaists. Known for her independent spirit, masculine dress, and bisexual tendencies, Höch then had a relationship with Til Brugman, the Dutch writer and linguist from 1926 to 1929. She continued to produce her own art and champion female rights until the onset of World War II when the Nazi regime banned all artistic movements, claiming them to be “degenerate.” Instead of fleeing Berlin, Höch chose inner exile so she could protect her precious artwork and Dada memorabilia. 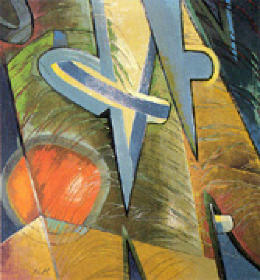 After the war, Höch quietly remained in Berlin and focused on smaller works. She died in 1978 at the age of eighty-nine. The Museum of Modern Art in New York held a retrospective of her work in 1997 to commemorate her contribution to Dada and women’s art as a whole. NMWA’s collection includes eighteen objects created by Höch. This entry was posted in From the Vault by Women in the arts. Bookmark the permalink.